Welcome to Family Tree Funeral Directors of Stroud. If you and your family want a funeral that reflects the unique life of your loved one who has died we can help. We will help you arrange a funeral that’s the kind of ‘goodbye’ that you feel they would have wanted. You no longer need to follow the old Victorian rules. Nor should you have to choose a range of services ‘off the peg’. We will offer and provide you with sensible choices that will allow you to personalise each element of the funeral. It can often be small touches throughout that reflect the life and character of the person who has died. You and your family and friends will know what these are. We will help you by knowing the procedures, the choices, the many small ways to reflect the life and character of the person who has died; and we will make sure these are included. This way a funeral can create new – even wonderful – memories, and leave you, your family, and all who were there feeling pleased and proud of the person they knew, and the farewell they’ve attended. Making funeral arrangements is usually a daunting prospect. Working with us alongside will make this a lot easier. We have experience of many different ways to add touches to even the most traditional of funerals so that it feels personal and heartfelt. A green funeral usually involves a coffin made of natural, simple materials and burial in a natural burial ground or private land. Usually there is no headstone or permanent marker on the grave but in a few sites a memorial tree may be planted. 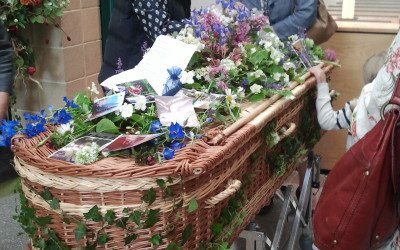 The intimacy, involvement and authenticity of a green burial funeral can be designed into a cremation funeral too. We will work with you to design and arrange the exact type of funeral that you and your family feel is right for the person who has died. Our aim is to work with you to make it special, and then make it all happen smoothly. Paying for your funeral in advance can bring peace of mind, knowing that it is all planned and paid for; it may even be a very good investment. But it will undoubtedly be some relief to your family when the time comes to arrange the funeral. You can have as much- or as little – involvement as you would like in the funeral arrangements, and at every stage of the process. If you prefer, you can leave everything to our professional team, knowing that it will all be done exactly as you would want. You can have anything from a traditional burial or cremation service, or simpler -more intimate – forms of these, to a full on formal burial at sea. Simply tell us something of your wishes and thoughts about it all, and we will work with you to plan and arrange the rest of the funeral with you – and make sure that it is what you want, and that it all happens smoothly. Whether you have just suffered a death in the family, or if you have someone close who is terminally ill and you just want to talk, you can call us at any time, 365 days a year. We will tell you what you need to do at each stage, and will organise everything. You also have the option of using a pre-payment plan for your funeral arrangements; at least you’ll know it is all planned and paid for. With funeral costs continually rising, your family would find this a valuable service. They’ll know what you wanted, there’ll be more money for them, and lowers the value of the estate and therefore in some cases have an impact on inheritance tax. BBC Radio 4 for Stroud Funerals! James Showers was a guest on BBC Radio 4's Saturday Live on his 68th birthday Dec 6 - as a Stroud Funeral Director who has had an interesting career.